CHAPEL HILL, N.C. (Seminoles.com) – When the game gets tight, experience is always key. Junior guards Nausia Woolfolk (20 points) and Nicki Ekhomu (16 points, 7 assists) made big plays in the fourth quarter to help No. 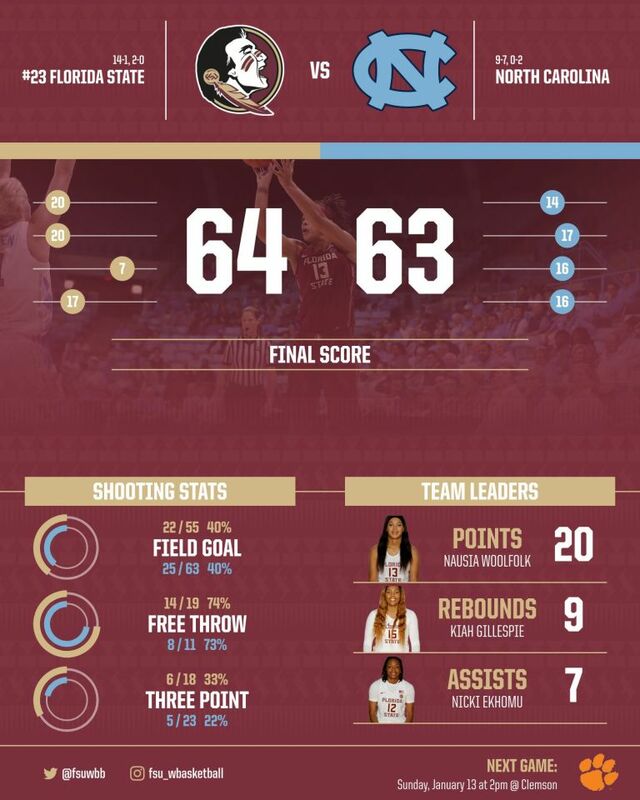 23 Florida State Women’s Basketball leave Carmichael Arena with a 64-63 win against North Carolina on Sunday afternoon. The Seminoles (14-1, 2-0) got down by as many as six points in the final frame, but Ekhomu’s refusal to settle for jumpers in the waning minutes created much-needed scoring chances for FSU. The Bolingbrook, Ill., native scored six straight points at the free throw line down the stretch by drawing fouls on aggressive drives to the basket, creating a 63-60 lead with 15 seconds left. Following a miss by UNC on a 3-ball that rimmed in and out, Woolfolk grabbed the board and got fouled. She made 1 of 2 from the line with seven seconds remaining, but that make was important as UNC’s Shayla Bennett launched a deep 3-point field goal with 1.9 seconds left to trim the Tar Heels’ (9-7, 0-2) deficit to 64-63. FSU, which saved its last timeout to advance the ball to the front court, ran a precise sideline play and Kiah Gillespie received the pass and ran out the clock. Gillespie added 14 points and nine rebounds while playing 39 minutes for FSU. Sophomore Savannah Wilkinson was valuable once again with seven rebounds off the bench, and freshman guard Amaya Brown added four points, three rebounds and two steals while playing solid perimeter defense. With the win, FSU wins their first two ACC road games for the ninth time in program history. The Seminoles extend their win streak against the Tar Heels to a program-record four straight games, and add to their current overall win streak at 10 straight. It was also FSU’s second straight one-possession win on the road after defeating Virginia, 63-61, on Thursday. In FSU’s five true road games this year, four have been decided by four points or fewer, with the Seminoles winning every game. The Seminoles had a tough time scoring in the third quarter, unable to get quality looks through most of the period as UNC out-scored FSU 16-7. The Tar Heels took the lead at 45-44 on a pair of free throws, but Gillespie responded with a needed 3-point field goal with 1:28 remaining to re-gain the lead. FSU had another strong close to the second quarter, going 5-of-5 down the stretch to take a 40-31 lead into halftime. Woolfolk knifed down the line for a driving layup with six seconds left to punctuate another good quarter, and she went into the locker room leading all scorers with 12 points. Ekhomu also picked up the scoring slack, adding 10 at the intermission. The nine-point lead was FSU’s largest of the half. The Seminoles finished the first quarter going 4 of its last 4 from the floor, as Woolfolk led FSU with eight points to help take a 20-14 lead. FSU shot 47.1 percent from the floor in the opening period, using a 9-0 run late to build the six-point lead. Ekhomu added five points in the first quarter, while Stephanie Watts led the Tar Heels with eight. UNC guard Paris Kea led the Tar Heels with 17 points, but fouled out with 49 seconds left when Ekhomu drew a charge on her as FSU led 61-58 – a critical play in the game. FSU’s next game will be its ACC home opener on Sunday, Jan. 13, at 2 p.m. against Clemson. The event will include Alumni Weekend, as several former FSU Women’s Basketball student-athletes will be in attendance.